Oooh, nice! :D Is that the one by HappyMaskSalesman? It looks just like the one from the game! Is it comfortable to wear? Can you see out of it okay? I don't know who made it! And it actually apparently didn't come with a strap, so I can't wear it without holding it right now. But it's all right to see out of! The holes in the actual eyes are way too far apart, but there're other eye holes in the corners underneath the eyes and the visibility is okay out of them! It's 3D printed, and it's all one piece, so it doesn't have any inherent weak points. The paint job is incredible too! Good news! I got a Switch for Christmas! All I have to do now it get some games for it! So I've been playing the Mii Brawler a lot lately, and maybe it's just because I main Young Link, but I keep thinking it would be cool if the mask blocked projectiles while you were crouching. I can see Skull Kid doing that too, knowing the mask itself is near indestructible. That's awesome! Do you have a link to it? It might be cheaper than the one I was thinking of getting, lol. In other news, I got a Switch and Ultimate for Christmas (albeit Ultimate came a day late) and I'm loving it so far! Maining Inkling until I get Skull Kid and Mewtwo (I love the Inklings sooo much and I've never even played Splatoon), and I've already got the Skull Kid Mii outfit, now I just need the hat! I'm afraid I don't, but my parents said that (a) it wasn't from that store, and (b) it was quite expensive. Good luck with the hat though! I've nearly completed Majora's Mask 3D. One track, after listening to it so many times via side-quests, stuck with me emotionally, Astral Observatory. The track's happy tone with a hint of fear and tension in its composition is masterful. It perfectly describes a near-apocalypse. I've said before, Theophany obviously makes incredible music, even if sometimes he goes a bit overboard compared to the source material; however, his rendition of the Astral Observatory on Time's End is absolutely phenomenal. I highly recommend you go find it and listen to it. Completed Majora's Mask 3D. This easily became my #1 favorite Zelda game of all time. This game has the ability to make me feel consistently tense/strategic, while also being able to maintain a very dark tone that makes the world and characters interesting to invest in. I would have liked to see a bit more exploration on characterization for some side quest characters and Skull Kid, but what large amount of dark content is provided is enough for me. I hope the next Zelda game takes notes on Majora's Mask's dark tone and tense game design. After playing this game, now I really want Skull Kid to be in, but that will not happen anytime soon. My dream Zelda game would be Breath of the Wild in Termina, with good dungeons and much more story. I desperately want to see Termina explored again and expanded upon, and it even has a perfect way for the blood moon to return. It won't be Majora's Mask 2, but recapturing the magic of Majora's Mask would be unbelievably difficult, and I think Termina itself is a fascinating world, so I would be extremely happy to see it revisited in such a majestic fashion. So he's not in. With this much support, he's bound to be in smash 6. I'll pledge my support already. Looking forward to it. Happy New Year Masked Marauders! And on the (Dawn of the) Final Day of the year, I got Skull Kid's Mii Costume. Been playing as him the past few hours and he's now my joint main with Inkling! (Haven't unlocked Mewtwo yet) Skull Kid's so fun to play. Mii Costume or not, it looks exactly like him so it works for me for now, and I can only imagine how fun it will be to play as him with a proper moveset later on! Announced the other day Majora's Mask 3D will be a Nintendo select in US. I hope it becomes one here in Australia, I need to replace mine. Hey, now I'll actually have something good to spend my 3DS Nintendo Network ID money on! I mean, I know there was that video questioning whether or not MM 3D was a bad remake, and the swimming does seem like it would be annoying, but still. I need to beat regular Majora's Mask, probably going to boot up my Gamecube for that at some point, lol. Anything that gains more support for Skull Kid is a win in my book! Hopefully Nintendo decides to do a Wave 2 of DLC that upgrades Assist Trophies and Mii Costumes in the future (and if not DLC than next Smash, but hopefully DLC). That would have been such a cool thing to add to the Mii Costume! Especially since just about no other Mii Costume has a mask like that so it would be a nice little touch. 3. Be confused as everyone looks the same and enjoy the chaos. But yeah, anyone who still wants Skull Kid in Smash better act fast and join us. We got big plans that would help benefit him. Color me intrigued! On that Discord server, right? If you give us more info here we could help spread it around! The DLC fighters are already decided. If Skull Kid isn't a DLC fighter no campaign is going to change that. However, a campaign could help his chances to be playable in a potential future Smash Bros if he isn't a DLC. Which is the plan. Just keep on making enough noise as a whole, so Skull Kid isn't completely forgotten and prove he has a fandom. This is not just for DLC, but definitely for the future to come. Or if they do more waves of DLC. Obviously there was a lot of outcry over Waluigi, so there's a chance he could be converted into playable through DLC, and if he can, other ATs can as well! Waluigi would be first in line, but I have to think Skull Kid would be second or at latest third. EDIT: Probably third. I briefly forgot about Isaac. A campaign could also get them to consider another wave of DLC where Assist/Costume characters including Skull Kid are upgraded. Of course it's too early for them to probably consider that seeing as not even the free DLC of Piranha Plant is out yet. But that's why it's good for us to get this movement going. The Wii U only had the one segment of DLC because it was a dying console by that time. From what I've heard, DLC is something they want to focus quite a bit on due to the Switch's popularity. I also heard recently that a Dragonball game was recently approved for a 2nd wave of DLC a while after their first wave was completely released. Skull Kid, Isaac, etc., may be out of the running for this Fighters' Pass, but if we show our support for Skull Kid and other Assists it may get Nintendo to consider creating a 2nd Fighter Pass with upgraded Assist characters after the first one is done with. If they don't start thinking about a 2nd (or 3rd) Fighter's Pass until after the current one is all revealed and released, we have about a year. That's a good amount of time to get this campaign going and make our voices heard. And if they do a Fighters Pass where they upgrade Assists, Skull Kid would probably be the easiest to do. Why? Because with the Mii Costume they're already a large portion of the way there. The Mii Costumes proportions are the exact same as Skull Kid's would be, and given how Trophies were replaced by Spirits, it seems that the most challenging part of making a character is the 3D model. And Skull Kid already has a fighter model that can run, jump, attack, do everything a proper Skull Kid would. They already literally have a large chunk of the work for a playable Skull Kid there as it stands. If 3D models really are most of the work, he's already 50-75% done. If any character were to next be upgraded from a Costume to playable, it would make sense to be Skull Kid, at least in terms of being the easiest. You might be right about Skull Kid's model, but his moveset is a totally different story. I probably wouldn't say he would be the easiest Assist to promote though. The first character that will be in line to get that treatment is Waluigi without question because Nintendo even knew about the backlash for him being confirmed as a Assist again and that really speaks volumes. Reggie even said that he knows and will try to aware Sakurai and NOJ about it. Fair point. I think that if we do get a wave of 5 Upgraded Assists/Costumes, I assume Waluigi, Isaac, and Skull Kid will be the first 3 in the running, at least. I would think Ashley and Takamaru for the last two in that scenario! That would be cool! I actually had to look up who Takameru was since I hadn't seen his name around, but I'd be on board with him being the last one! Gives me Samurai Jack vibes. Honestly, I could see more people leaning more towards Bomberman or Shovel Knight over Takamaru. Ashley though is definitely a contender. What if there was a game where Skull Kid was the player character? I could see a game focused around Skull Kid would be similar in layout to The Legend of Zelda, Majora's Mask (3D, open world, etc. ), but it would reply heavily on the psychological aspect. You start off as Skull Kid stealing the mask from the Happy Mask Salesman, and then travel to Termina. Regarding the question of whether Termina is real or it was an illusion created by Majora (as that non-canon encyclopedia seems to imply), the game would borrow aspects of both. 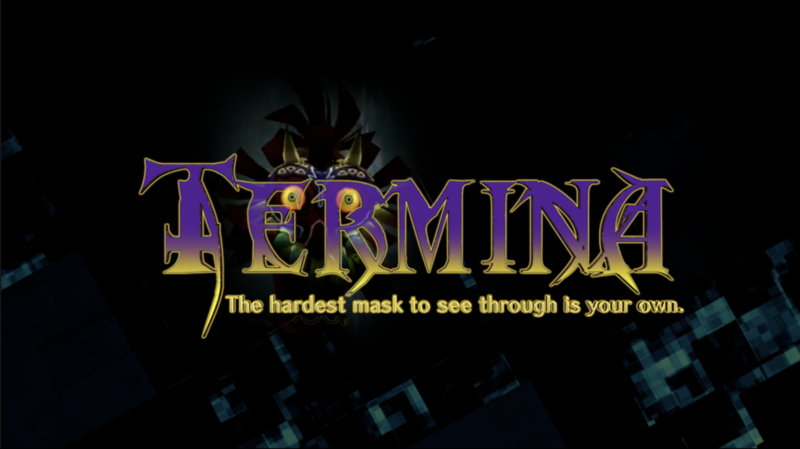 Termina would be shown to be an actual place, a parallel to Hyrule as implied in the game itself, but it becomes a bit more distorted and strange as we see it from the perspective of Skull Kid's psyche. We get a sense of how Termina actually is versus how Skull Kid sees it to be with Majora's "help". The Field of the Moon Children, or at least an area similar to that, could act like a sort of hub world, or an area where Majora and Skull Kid talk. You'd get stronger from Majora essentially granting Skull Kid new abilities as part of their game, preying on his loneliness and putting up a front as his friend, though really being more of an enchantress putting him under a spell. While the game would have "dungeons", so to speak, all of them gone through are all manifestations of Skull Kid's psyche that he has to confront. His former friendship with the giants (and Tael who he'd be separated from that that point), his sorrows, his liking for playing pranks that increases and becomes warped as Majora's power takes over him. As the days progress and the Moon draws closer, Majora's power over Skull Kid's mind becomes more overt. The final battle could be like a "Battle in the Center of the Mind", which culminates in Skull Kid having to fight a merged manifestation of himself and Majora as the Moon descends upon Termina. Following Majora's defeat (Skull-jora? I don't know), the game would end in a similar fashion to Majora's Mask. Think the original Majora's Mask mixed with American McGee's Alice, and you basically have what I think would be a cool game centered around our favorite forest imp. Heck, even though this will likely never happen I even did a logo/cover art with a tagline because why not. Image isn't showing up for some reason on here so have a link instead. (I would have called it "Terrible Fate" but there's that excellent Skull Kid short film by that name already.) I wrestled with about 3 different tagline options before I picked this one. Honestly if this kind of thing was done as a fan project (even just like with Source Film Maker since I know people have made Zelda assets for that) I'd totally watch/play it. EDIT: What the heck, I compose music so maybe I'll do a concept album in the future based around how it would go. I mean, I would prefer Shovel Knight, I just think people have been asking for Takamaru for a while. That's even why his NES game out over here a few years back on the 3DS, I'm pretty sure. I dunno though! I definitely think Waluigi, Isaac, Skull Kid, and Ashley have very good chances in this theoretical situation though. It's just the fifth character who's kind of up for debate. Glad to get your spirits raised, trust me the way Skull Kid was revealed in the end was anticlimactic after the whole Loz ordeal. It likely hurt a lot given we all thought he had a chance. But now, we shouldn't falter and really keep spreading enough misfortune for Majora's sake. The last part is a joke really and a figure of speech for us pushing for Skull Kid no matter what. My most wanted character out of the Assist Trophies is Krystal, so I hope she will be one of the Assist that will get promoted to playable status in the same game if that day ever cames. It's hard for me to choose between Krystal and Bomberman, but- who am I kidding, I'd choose Bomberman every time. You always go for your number 1 no matter what. But most importantly, inspire all of your fellow Skull Kid fans left here or on social media. Just so they never give up hope. Keep that same fire you all had since Loz came into the picture, even if it stings. I agree that it's likely not a question of if they will, but rather when they will and what form it will take. I have my doubts that it'll be AT promotion, but it's not an impossibility!